While there are a lot of people out there that who are scared at the thought that Google is the new Microsoft of the late 1990s and early 2000s, you have to admit they do a great job at making things easier. 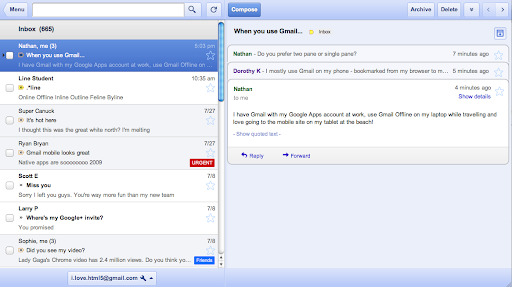 Google is now giving gmail users the ability to access email without an internet access. While this is basically a Microsoft outlook steal, it does make it easier for folks like me that are tied to gmail. In recent years, there has been a big push from Google to be the email provider of many businesses and schools. Now you can download a chrome add-on and you can search and review email even without an internet connection. Great stuff Google. Check out the add-on here. So sometimes you are constrained by physical barriers to get your events to a potential audience. I remember a few years back, I was the director of a talent show that brought in around 1500 people, but there were multiple rooms with different things going on. I envisioned having the show streamed live to tvs in the different rooms, but we were constrained by the picture quality of the transfer and the power of the video receiver since it was a closed circuit system. While surfing the web I found a new option for those interested in juicing up their websites, events or businesses by easily providing the live streaming option. It is actually an attachment that you can place on a handheld camcorder. Once you set it up it uploads, live, directly to your livestream.com account. Pretty awesome. It does come at a $2000 price tag, however depending on your budget, this may be a great option for you. I was doing research on sitewide redirects and found out that I wasn’t sure of what all the characters and symbols meant. I found a great resource through SEOmoz that talked about the basics of RegEx and another source where you can download a handy dandy cheat sheet. Enjoy.